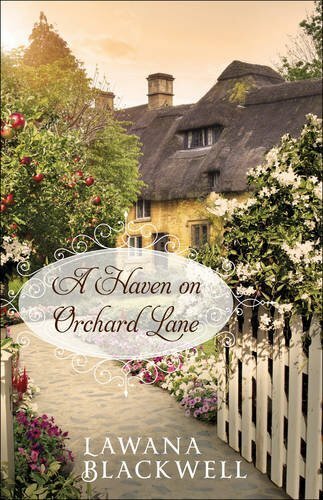 A Haven On Orchard Lane by Lawana Blackwell is a wonderful historical Christian novel set in 1880 in England. There are many themes within the novel and one of those is that of fathers. Earthly fathers can be fickle and have their faults. They are all shown to be lacking. In contrast there is our Heavenly Father Who will not let us down and always has our best interests at heart. Prayer is another major theme. When life is difficult, characters turn to God in prayer. When life is good, they thank God. Prayer should be a two way communication but “prayer is conversing with Him. But too often it is one-sided.” We need to remember to pause and listen for God to answer. The novel reminds us that where two or three are gathered, Jesus is there too. The characters go to church but there is a time when they are unable to do so. Three of them gather in the living room and wait on the Lord. The theme of forgiveness and regret permeates the story. Charlotte, an actress gave her baby Rosalind to her aunt to bring her up. It was done in order to give Rosalind a stable upbringing. Now twenty seven years old Rosalind is full of hurt for the lost years. Charlotte hates herself for giving up her baby, even though it was done out of love. As the pair meet up there is a lot of hurt and regret. In order to heal, forgiveness needs to be given and received. The face in the mirror needs forgiveness too and this is hard to receive. Within the tale there is a sub plot similar to Cinderella. There is a cruel stepmother and two little boys… Danny aged ten and Albert aged four. Their brotherly bond is unbreakable and delightful to witness. There are racial and religious prejudices seen within the novel. These tug at the readers heart with the sense of injustice and outrage. How people can treat others differently due to the colour of their skin or their religious persuasion is just plain wrong. Thankfully Lawana Blackwell has characters who look beyond this and into the heart. And there is God Who loves all His children. “It took much prayer. The hatred was a ball and chain.” Hatred due to treatment by others needs to be dealt with or our lives will be ruined. It needs to be given to God, forgiveness extended and then there is freedom to move forwards. Lawana Blackwell shows how destructive gossip can be. One must avoid gossiping at all costs. Gossiping destroys lives. The power of love invades the whole novel. There is the love of God, the love of a mother and daughter, blossoming romance and the love for children. Love is powerful. It is faith in action as the command to take care of the widows and orphans is played out within the novel. The action in the story moves from Lincolnshire to London, Cheltenham and Devon. Lawana Blackwell has some wonderfully descriptive passages so the reader can really ‘see’ the places in the novel. A Haven On Orchard Lane is a delightful study of both relationships and country life. This was my first novel by Lawana Blackwell and I am now hooked. I loved her style of writing. I loved her characters. I adored Danny and Albert. There were some beautifully touching moments involving them in the novel. The story is over. I feel lost. I have left my friends behind. More please Lawana Blackwell. Escape to the nineteenth century countryside and leave modern life with all its pressures behind. Grab a drink, a comfy chair and settle down with A Haven On Orchard Lane – you won’t regret it.